More than 100 people attended a rally for gun control January 10. It was organized by a Brattleboro-based group and was at the Vermont statehouse in Montpelier. 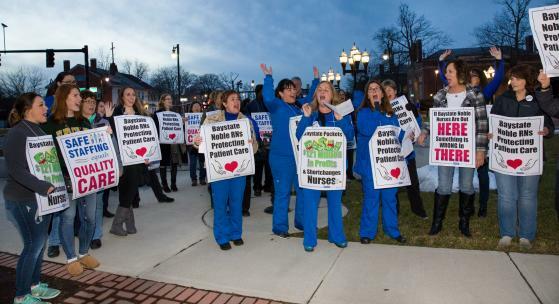 On January 11 in Westfield, Massachusetts, dozens of nurses and their supporters attended a rally for justice. Westfield is near Springfield. The nurses work at Noble Hospital. They are demanding fair wages and benefits, and a limit on how many patients each nurse is responsible for. The nurses have a web site at www.MassNurses.org. Companies that make guns invest tens of millions of dollars lobbying against gun control laws. Gun violence means big money for private prison companies. The state of Vermont uses a private prison corporation. "The presence of a gun in domestic violence situations increases risk of homicide by 500 percent," according to the web site of the group that organized the January 10 rally, Gun Sense Vermont. A 2016 poll by Vermont Public Radio found that 89 percent of Vermonters want the governor and legislature to enact a law requiring a criminal background check before anyone can buy a gun.